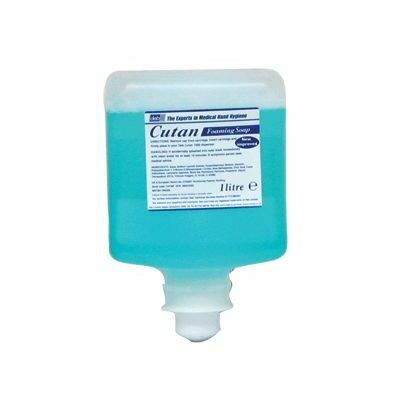 A mild foaming handwash for frequent use, Cutan Foam Soap is suitable for use* in care homes, and ideal for use in nurseries and primary schools: children love foaming products, so this foam soap is a great way to encourage hand hygiene best practice. Millions of school days are lost each year due to illness, however, the spread of germs - which can lead to tummy bugs, colds etc - can be reduced by effective hand washing. Cutan Foam Soap provides a user-friendly, convenient and economical hand washing system: use with the following dispensers: Gompels Deb Liquid Dispenser; the Catch it, Bin it, Kill it Liquid Dispenser; and ideal for nurseries/schools -Mr Soapy Soap Dispenser Mr Soapy Soap Dispenser; Sarah Sheep Soap Dispenser. not be used in food preparation areas, to avoid tainting foodstuffs. Specially formulated by Deb, a world leader in occupational skin care and hand hygiene. Have you seen our children's V fold hand towels, great for nurseries, or our V fold hand towels perfect for care homes.